The idea of SAGA is to not only provide a single game mechanic, but to eliminate the arbitrary nature of "points" in a skill-based role-playing game. This is done by assigning numbers of dice to Attributes, Skills, and Sub-Skills. 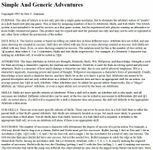 The SAGA system is not intended to be used by novices as a first game system, but for experienced role-players wanting an alternative to more bulky commerical games.